Fall perennials breathe new interest and life into your garden at the end of the season just when everything is beginning to slow down or look ratty. Some of the loveliest flowers bloom at this time of year and they complement the changing leaves beautifully. There are a lot of choices, too! Some autumn flowers that we think of as fall perennials actually begin blooming at the beginning of summer and continue into fall, while others wait patiently to reveal their beauty at the end of the season, and many continue on until frost puts an end to their play. Aconitum carmichaelii, azure monkshood, Zones 3-7. These curious hooded flowers resemble ancient soldiers helmets rather more than monk’s hoods from which they get their common name, but maybe “helmethood” wouldn’t quite have the same aura of mystery. 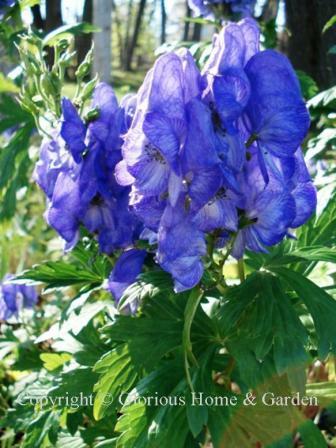 Nevertheless, monkshood is one of the latest-blooming fall flowers, and the rich blue is outstanding in the border. However, be aware that monkshood is also poisonous in all parts and should definitely be kept away from areas where small children play. The positive side to its toxicity is that deer avoid it. A carmichaelii grows to about 2 to 4’ tall with deeply cut foliage and prefers full sun to semi-shade, rich moist soil, and good drainage. Monkshood grows best in areas with cooler temperatures. Actaea simplex, bugbane, Zones 3-7. This late-summer-to-fall blooming perennial has undergone a name change. Formerly known as cimicifuga, it is a great addition to the late autumn garden no matter what you call it. The deeply cut foliage is attractive and the pure white candle-like racemes glow in the border. This species is said to tolerate dry shade well, but would prefer good humusy garden soil--moist, but well-drained--in part to full shade. 'White Pearl' is a lovely cultivar, 'Carbonella' has purple foliage, and 'Hillside Black Beauty' has dark leaves and stems with pale pink flowers. Anemone × hybrida, Japanese anemones, Zones 5-7. What a lovely plant this is in the late summer to fall garden--graceful, colorful and charming. Some of the best cultivars are 'Andrea Atkinson,' semi-double white with green eye, 'Honorine Jobert,' white; 'Queen Charlotte,' semi-double pink (pictured); 'September Charm,' pink; and 'Serenade' also pink. Attracts butterflies. One of the best fall perennials. Anemone tomentosa, grapeleaf anemone, Zones 4-8. 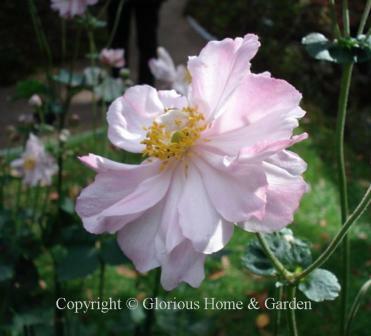 'Robustissima' has soft pink flowers and reaches 36". 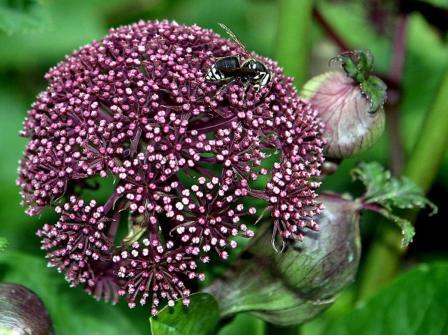 Angelica gigas, purple parsnip, Zones 5-7. This biennial will reseed and behave as a perennial if it's happy (moist, sunny areas). A large (3-5') plant, it needs room. In the back of the border the large round purple flower heads will be a standout in late summer into fall. Aster lateriflorus, calico aster, Zones 5-7. 'Lady in Black' is a cultivar of this species making an outstanding display in the autumn garden with loads of small white flowers with raspberry-pink centers forming a compact 3' mound. The dark purple foliage is outstanding too. A butterfly magnet. 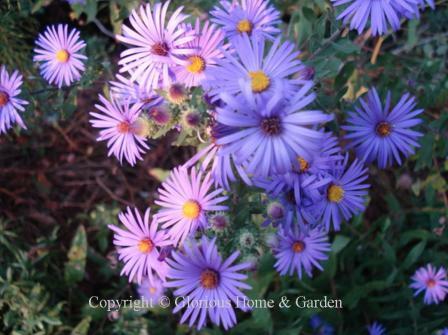 Aster novae-angliae, New England aster, Zones 4-8. No fall garden should be without at least one of these tall fall perennials (4'-6'). These beauties are so smothered in small rayed flowers that they benefit from staking. 'Alma Potschke,' red-pink; 'English Countryside,' lavender-blue (pictured); and 'Purple Dome,' purple. 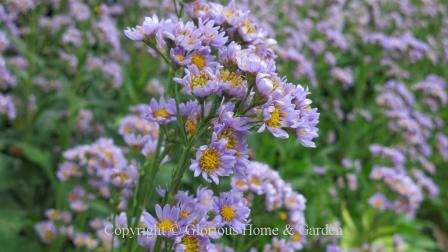 Aster novi-belgii, New York aster or Michaelmas daisy, Zones 4-8. There are so many great cultivars of this native aster that it's best to visit your local nursery and choose one that's best for your area. They come in shades of white, pink, rose, red, lavender, violet and purple, and in sizes from dwarfs to 6' giants. 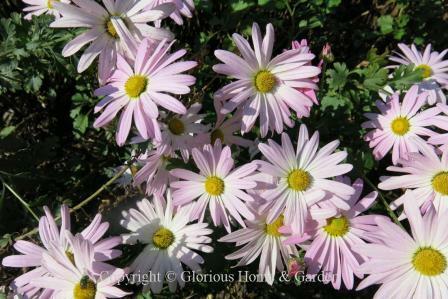 Aster tataricus, Tatarian daisy, Zones 4-8. This fall perennial is a tall stately plant (3-7') for the back of the border that seldom needs staking. Dense clusters of soft lavender flowers with yellow centers form atop tall stalks rising from a leafy base. A shorter cultivar called 'Jin-Dai,' reaching 3-4' tall is shown below. 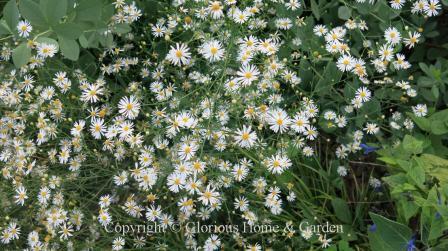 Boltonia diffusa, smallhead doll's daisy, Zones 5-9. This native of the southeastern U.S. produces mounds of tiny white daisy flowers in great abundance. Great filler plant to use around other perennials. Ceratostigma plumbaginoides, leadwort, Zones 5-8. 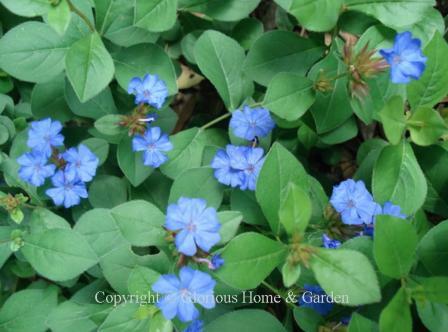 Leadwort is an excellent ground cover that produces brilliant blue flowers in late summer into early fall and forms a spreading mound via rhizomes. As a bonus, the leaves turn bronze-red in the autumn. Chrysanthemum × morifolium, hybrid chrysanthemums, Zones 5-9. A larger cousin of asters, chrysanthemums are fall blooming perennials that pack a dependable punch in classic autumn shades of white, yellow, gold, bronze, pink, red and purple. They come in many flower forms as well, but most of those sold for the garden or containers are the cushion or daisy types. They are easily grown, and spread to increase in size where happy--that is in full sun and good, well-drained garden soil. Pinch them back a couple of times in spring and early summer to make compact plants and produce more flowers. Enjoy in containers and plant them in the garden when they finish blooming. A good garden variety, 'Cambodian Queen,' soft pink is pictured, and below that is 'Lava,' a bright yellow exhibition spider mum. Chrysanthemum nipponicum, Nippon or Montauk daisy, Zones 5-9. 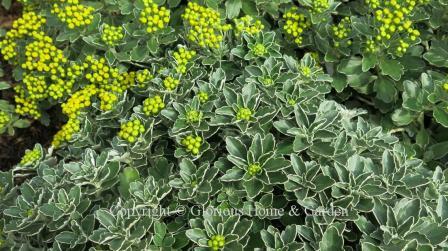 This mum has attractive foliage that is topped with large, white daisy-like flowers with greenish-yellow centers in late fall, blooming until frost. 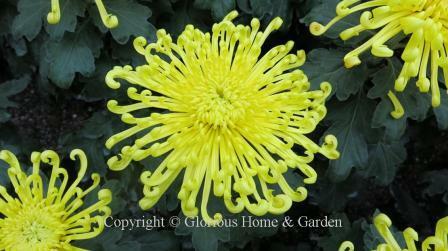 Chrysanthemum pacificum, silver and gold, Zones 5-9. This late fall perennial is attractive in the garden even when it's not in bloom with its green foliage edged in silver. The plants are topped with small bright yellow flowers in late fall. Plant in full sun in moist, but well-drained soil rich in organic matter. Clematis terniflora, sweet autumn clematis, Zones 5-8. 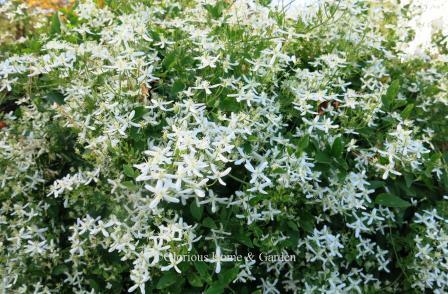 Sweet autumn clematis is a very vigorous vine that blooms in the late summer and fall. The four-petaled flowers are fragrant and become feathery seedheads. The blooms completely engulf the plant, which is delightfully showy, but beware of its invasive tendencies.